The Billionty-Oneth Geek: Victor Crowley lives!!!!! HATCHET II arrives!!!!!!! Victor Crowley lives!!!!! 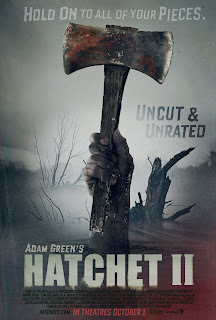 HATCHET II arrives!!!!!!! You know, I feel blessed living in Toronto. 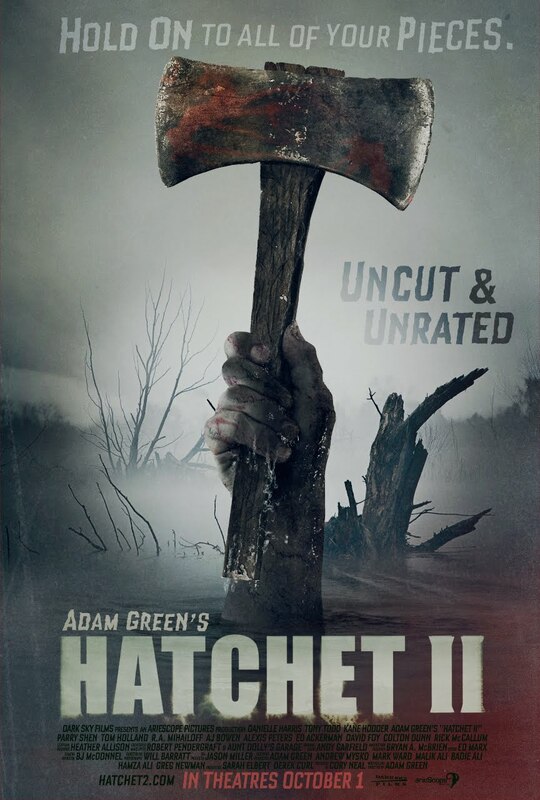 You see, for a limited time, Hatchet II is screening in select cities across the USA and Canada. The AMC theater in downtown Toronto is one of 2 theaters across Canada participating. Even though The Social Network and Let Me In were released (both to raving reviews), the chance to see a Hatchet movie on the big screen was an opportunity that I couldn't pass up. Hatchet II picks up immediately where the first one left off. The lone survivor, Marybeth (Danielle Harris), is fending off an angry and injured Victor Crowley in the swamps of Louisiana near New Orleans. Victor Crowley is of course the hatchet wielding killer — a deformed ogre-like hillbilly that lurks in the swamps. She frees herself from his clutches and makes her way back to New Orleans, to the shop of one Reverend Zombie (Tony Todd), the mysterious magician like shopkeeper that directed the previous group to Crowley in the first place. Marybeth, wanting revenge on Crowley, demands that Zombie take her back to the swamp to retrieve the bodies of her brother and father. Zombie agrees only under the conditions that he can bring his own team to the swamp to take the killer out. But what she doesn't know of is Zombie's real plan of breaking the curse that surrounds Crowley by letting him kill a few of his own. I much enjoyed this movie, but I wasn't loving it as much as I hoped to like I did with the first one. Adam Green, who wrote and directed again (as well as the first one) did some pretty interesting things with the story. He expands on the lore and mythos behind Crowley. We're given more insight into his origin but it's left with room to create more mystery. The ideas behind the curse of what is Victor Crowley are also intriguing, but they're only ideas and not solid facts, hopefully to keep doors open for any future sequels (how do we even know that a curse is true?). He also fleshes out Zombie's character, who was only a cameo in the first movie, most likely a delight to horror fans familiar with Tony Todd's work as The Candyman from the 90's. Much like the first movie, Hatchet II is filled with geektastic cameos and appearances by horror icons of the past. I was nearly floored when I saw John Carl Buecheler's name during the opening credits. Buecheler is probably more known for his directing gigs than acting ones, specifically for his work on Friday the 13th Part VII, a beloved movie to Friday fans. One thing that really threw me off was the replacement of the original actress with the ever-so-cute scream queen, Danielle Harris, in the Marybeth role. The movie opens up, and we see her in terror as Crowley tries to throttle her, and it sort of threw me off because I didn't remember Harris in the role originally. It fooled me and made me think that there was a gap in between the last movie and this one. Green takes a cue from Tarantino's book as he gives a hint that his movies may exist in the same continuity. There's a cue early on in the movie that suggests that the world of Hatchet may be in the same world as Frozen, Green's other feature earlier this year. I admit, when I saw the clue, I cheered and clapped, but was slightly embarrassed as I was the only one (well... given that there were only 30 people in a 300 seater auditorium). As I said, I didn't love the movie as much as I hoped to. I think a lot of it has to do with the plethora of generic characters. The team that's assembled in the latter half of the movie seem to be all disgruntled old men in flannel shirts. Except for the token black guy and the generic hot blonde girl, the rest of the team aren't really even given roles to fill. They are clearly there to be fodder. Another problem was with the pacing. The movie doesn't exactly hit the ground running. There's a lot of time devoted to set up and telling origin stories before anything gets going. This would be fine were it another kind of movie, but Hatchet is a slasher movie, and the slow pacing hurts a movie of this genre. What we have in the end is a series of scenes that are rushed and more akin to a montage of horror movie kills than a horror movie itself. In fact, in the middle of the movie, there IS a montage of deaths, which is sort of played for laughs. Perhaps it was parodying itself? But that said, the kills were good, bloody and creative. I don't know if it's because the movie was unrated, but the theme of the kills seemed to be overkill. You'd think that ripping out a guys intestines was enough, but no. He uses the intestines to strangle his victim. Is that enough? Nope! He strangles the guy so hard until his head pops off. Yup. There's a few instances of guys getting their faces so mashed in until there's only pulp left at the end. Four or five hits to the face would be good enough, but Crowley goes for the extra mile with twenty to thirty hits. Pretty unbelievable. There's also a lot of cutting in halfs, I think those were my favourite deaths watching horror movies when I was younger, because they were so rare. But this movie is littered with them. So I guess what I'm saying is that if you're a gore hound, then it's a bloody good time. I'm glad I caught this in the theaters. While it's true that it wasn't a great movie, just the honor to see such a B-movie (pretty much a DTV movie no less) on the big screen is a thrill. I can't really say I recommend this unless you're a real horror or blood fan, but if you want something fun and silly, I recommend the first Hatchet movie instead. Til next time, later geeks!